Phil Stebbing (left) scored twice for Yaxley against Sileby. All-conquering Peterborough Sports have set a standard rivals Deeping Rangers and Yaxley FC are keen to match. Sports will officially clinch the United Counties Premier Division title by claiming a point from a tricky trip to Desborough on Saturday (April 8). Olly Medwynter (centre, blue) scored the winning goal for Peterborough Sports at Desborough last weekend. The city side will then bid farewell to the UCL at the end of the current campaign and play at step four level next season. Deeping and Yaxley, who are currently second and third in the Premier Division, hope to be re-united with Sports the following season and both clubs have taken steps to improve their chances of title glory in 2017-18. Deeping have appointed Leigh Porter, a former high-ranking Peterborough United official, to a new post of general manager while Yaxley will enter a reserve team into UCL football next season. “We’ve travelled to three games with the bare 11 players this season,” Yaxley boss Brett Whaley revealed. “We’ve got away with it, but it’s far from an ideal situation as we want to follow Sports and win promotion to step four. “That’s the aim of the club. We are determined to secure a top three finish for the first time in the club’s history this season and then kick on and win promotion next season. We will need a bigger squad to achieve that. “There should be a more level playing field next season. There have been some big-spending clubs pass through the UCL in recent seasons like St Neots, Spalding Rushden & Diamonds and now Peterborough Sports, but budget-wise it should be more even. Yaxley have won their last four Premier Division matches. A Phil Stebbing double earned them a 2-1 win over Sileby last weekend and they will expect to make it five wins on the spin at lowly Boston Town on Saturday. Deeping, who are without a fixture this Saturday, also made it four wins in a row with a 4-0 success at Rothwell Corinthians last weekend. Spalding United have a brutal few days in Division One South of the EVO Stik Northern League. 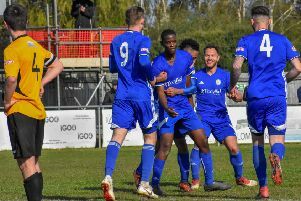 The play-off chasing Tulips are third in the table and travel to play second-placed Witton Albion tonight (April 6) before visiting mid-table Kidsgrove on Saturday. Stamford AFC chairman Bob Feetham has stepped down at the Zeeco Stadium to make way for a younger man. The Daniels made club history by reaching the first round of the FA Cup this season, but have laboured in the league. They are 17th ahead of a home game with Basford on Saturday. Division One South: Witton Albion v Spalding Utd. Premier Division: Peterborough Northern Star v Wisbech Town (7.45pm). Division One South: Kidsgrove Athletic v Spalding Utd, Stamford v Basford Utd. Premier Division: Boston Town v Yaxley, Desborough Town v Peterborough Sports, Harrowby United v Huntingdon Town, Holbeach United v Cogenhoe United. Division One: Bourne Town v Blackstones. Division One: Diss Town v Wisbech St Mary, March Town United v Dereham Town Res.